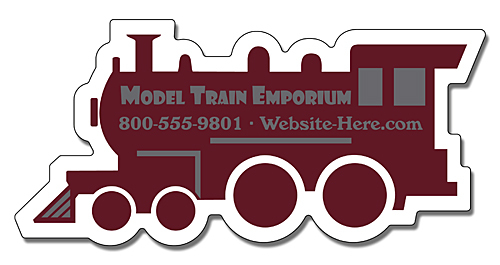 A 4x 1.9 train engine/ locomotive shape magnet is outdoor safe and it can be sought by all types of advertisers. It can aid advertisers who wish to promote a private model train museums or toy train manufacturers to attract new prospects. These advertisers can order it in bulk and get it customized for fee as low as $0.15. If they are buying it in small numbers, then they may have to pay $o.68 towards customization. Product Size : 4 in. x 1.9 in.